Works with Unisteer Power Steering Unit. Mounts in stock battery location. Made to fit Odyssey PC925L Dry Cell Battery (see battery size below). Laser Cut and CNC formed insure a consistent fit every time. Stainless Steel battery strap with laser cut logo. Now, you can replace the weak stock battery with a Odyssey PC 925L rugged dry cell battery. This is the last piece you need to replace the stock battery. 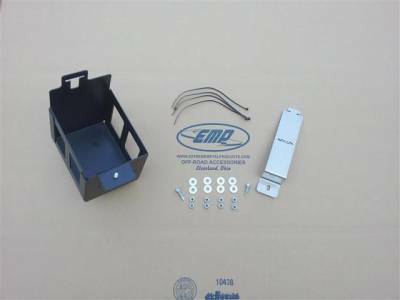 Simply remove your stock battery box and replace with the EMP battery box. Mounts under the dash in the stock location. Odyssey PC925L Dimensions (6-15/32" x 6-7/8" x 4-7/8"). If you are using a different battery check your dimensions before ordering.